Breakfast, lunch and dinner on the go! In a hurry? All menu items from our large restaurant menu are available in a convenient to go menu. It's as easy as 1-2-3, call in your order at (530) 790-0300, pull up curbside on the West side of our restaurant, pick up and go! Need to feed a crowd? Order your next spread from the Dancing Tomato Caffé’s Large Party TO GO menu. From corporate events to family reunions, we make feeding a crowd easy and stress-free. Be on the lookout for Stew D. Baker, dancing his way through traffic, to bring yummy creations to your next gathering of hungry guests. 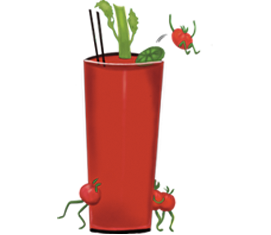 With our help, you can pull off a deliciously successful meal that will have you doing the happy tomato dance.